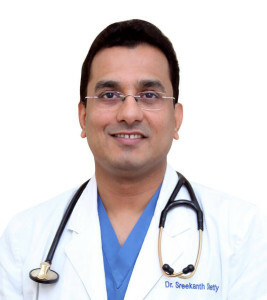 Dr Sreekanth Shetty, Senior Consultant and Head , Interventional Cardiology, Sakra World Hospital writes on-how heart failure is a highly underestimated health concern in India. India is going through a demographic transition. There is a rapid urbanization across the country. Paralleling this change , there is also an epidemic of lifestyle disorders that is afflicting our population. There are at least 50.8 million diabetics in India, which is the highest ever reported number from anywhere in the world according to International Diabetes Federation. The prevalence of diabetes varies between 6-8% in urban and 2-3% in rural adults. Indians tend to be diabetic at a relatively young age of 45 years which is about 10 years earlier than in West. There appears to be a steady increase in hypertension prevalence over the last 50 years, more in urban than in rural areas. Hypertension is 25-30% in urban and 10-15% in rural subjects. Sedentary lifestyle is a major cause of death, disease and disability. Physical inactivity increases all causes of mortality, doubles the risk of cardiovascular disease, type II diabetes and obesity. It also increases the risk of colon and breast cancer, high blood pressure, lipid disorders and anxiety. With increasing incidence of diabetes and hypertension , there is an increase in incidence of coronary artery disease. Current projections suggest that India will have the largest cardiovascular disease burden in the world. One fifth of the deaths in India are from coronary heart disease. By the year 2020, it will account for one third of all deaths. Sadly, many of these Indians will be dying young. Heart disease in India occurs 10 to 15 years earlier than in the west. There are an estimated 45 million patients of coronary artery disease in India. With increasing incidence of cardiovascular disease, India is witnessing a simultaneous surge in incidence of heart failure, including among relatively younger men and women who were earlier considered out of the risk bracket of this condition. However, awareness about heart failure, its causes, and treatment mechanisms remains low, suggesting that our healthcare system as well as society is not prepared to deal with this rising burden. Many people suffering from heart failure do not have the condition diagnosed. Many others who have been diagnosed fail to get appropriate treatment which makes them highly susceptible to sudden cardiac death. Heart failure is a condition in which the heart muscle is unable to pump enough blood to meet the requirements of the body. This leads to fluid build up in various parts of the body causing swelling of the feet and breathlessness , particularly on exertion and on lying down. Among the leading causes of heart muscle damage and subsequent heart failure are heart attacks and coronary artery disease. Patients survive heart attacks better with prompt treatments by coronary angioplasty go on to live longer and productive lives . If treatment is delayed ,the damage sustained in the episode leaves them vulnerable to heart failure. Comprehensive data on prevalence of heart failure and its figures in India is lacking. According to a study published in the National Medical Journal of India in 2010, the estimated prevalence of heart failure due to CAD, hypertension, obesity, diabetes and rheumatic heart disease alone ranged from 1.3 million to 4.6 million, with an annual incidence of 491, 600 to 1.8 million. However, these did not account for other important causes of heart failure such as alcohol abuse, cardiomyopathies, pericardial disease and endomyocardial fibrosis. Apart from a previous history of coronary artery disease, patients who have hypertension, obesity, diabetes or those with congenital heart disease are also at higher risk of suffering heart failure. Damage to the heart muscle or cardiomyopathy can also occur due to some diseases and infections or toxic effect of certain drugs. Besides, myocarditis or inflammation of the heart muscle is commonly caused by a virus that can lead to left-sided heart failure. The measure of a heart’s pumping ability is called Ejection Fraction . Heart failure that results from a reduced ejection fraction is called Systolic heart failure. However patients can develop heart failure even with a normal Ejection fraction and this is called Diastolic heart Failure.Thos with very low EF I.e. less than 30 % , particularly following a heart attack are prone for death due to cardiac arrest ( Sudden cardiac death , caused by heart rhythm disorders). People who have suffered heart attacks or have CAD need to have their EFs monitored regularly, especially if they have experienced symptoms such as shortness of breath, fatigue or episode of fainting. Outcomes in patients on heart failure have improved substantially over the last two decades due to the availability of drugs such as beta-blockers , ACE inhibitors , ARBs and Aldosterone anatagonists . Guideline directed use of these drugs helps heart failure patients survive longer and lead more comfortable lives . Strict adherence to lifestyle changes and restrictions on salt and fluid intake is a must to prevent repeat hospitalisations. Patients with Low EF with Heart failure need to have a Defibrillator implanted ( AICD ) to reduce risk of sudden cardiac death . Some of these patients may benefit from implantation of a CRT ( Resynchronisation Therapy ) to improve their EF .In carefully selected patients this therapy significantly improves outcomes. At the same time, people who have had devices such as ICDs implanted to manage heart failure also need regular monitoring. There may be some challenges in ensuring regular follow ups and this may lead to unwarranted shocks by the device and hospitalizations. Sometimes, a medical event in between the visits could go unnoticed and be life threatening to the patient. based remote monitoring technology enables physicians to continuously and reliably monitor their patients’ clinical and device status from anywhere and minimize risk of any negative medical event. Having the ICD wearers constantly connected to their physician, home monitoring technology enhances safety for heart failure patients. Despite above improvements , some patients with heart failure continue to worsen over time reaching a stage of what is called Refractory or Resistant Heart Failure , a situation where the patient has severely limited physical abilities and is repeatedly hospitalised with a high probability of death. Such patients require advanced heart failure care including LVAD ( Partial Artficial heart ) or Heart Transplantation . Since these therapies are extremely expensive or are difficult to avail , the best approach to heart failure as for most other diseases is prevention , and these efforts should begin even before diabetes or high blood pressure show up.